After thinking about my review of the Cobra Shock Trooper, I realized why I like him so much. He reminds me of the vintage Firefly. Must be the grey camo. Firefly is the “Cobra Saboteur” according to his vintage card. He’s a guy that will sneak in, plant a bomb, and leave. Sadly, this type of fighting has became more relevant to the news in the 25+ years since this figure was originally released. 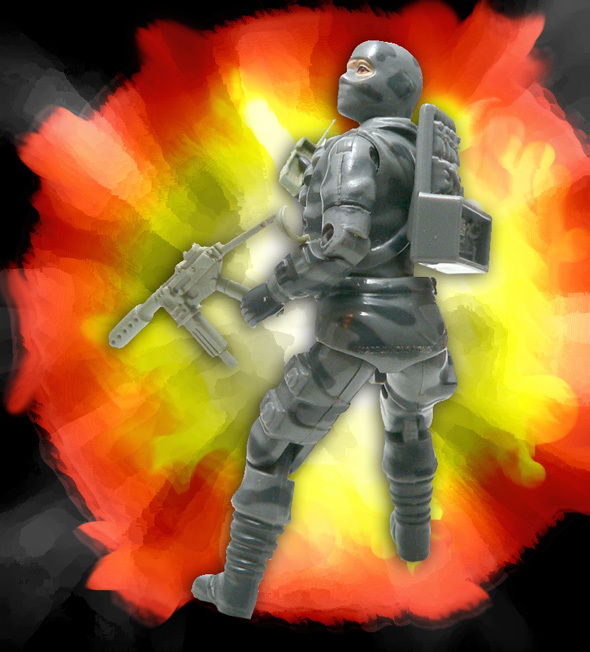 Similar to the Shock Trooper, Firefly appears to be a generic urban trooper. 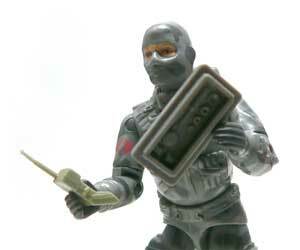 He’s outfitted in two tone grey camo with a ski mask. The only thing that identifies his affiliation is a single Cobra logo on one arm. This guy is sculpted armed to make some stuff blow up. Two ammo belts cross his chest, one of which has grenades attached. They cross in front of a rather spiffy turtle neck showing through the open collar of his shirt. Additional explosives are sculpted on the left side of this torso. It doesn’t stop there. There some charges or timers sculpted on his left forearm and a knife on the right. The arms are fairly generic, as are the glove hands. 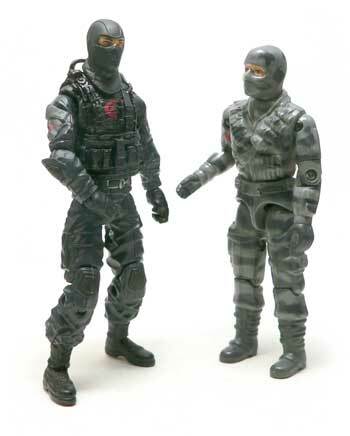 The Cobra logo on the right arm is recognizable, but not as crisp as some of the modern figures. The sculpted mayhem continues on to his legs. There is a a special holder on his left leg for even more charges. My only complaint on all of these is they are fairly soft in detail. A touch of detail paint would have perhaps helped. The right leg gets a pretty cool looking sculpted holster and gun. This was the Eighties people. Working holsters were a rarity. The boots aren’t standard combat boots. They look more like some kind of motorcycle boot. They have some straps instead of laces. The ski masked head is actually pretty cool for the era. The eyes are uncovered and painted in a flesh tone. 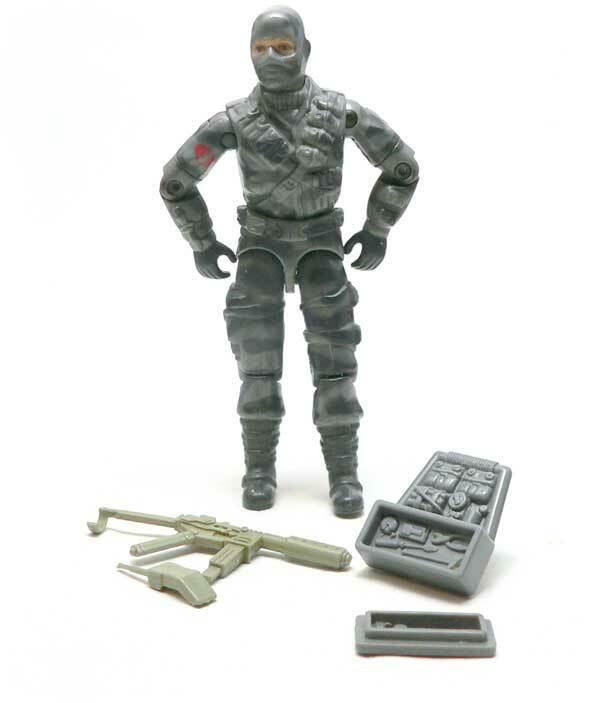 You can also see the lips sculpted under the mask, which works better for Firefly than Snake Eyes. The thing that is pretty neat is the ears are sculpted as well. It really adds that extra touch. A general note on the camo paint, it’s good. For being only one color, it covers all the pieces and doesn’t have any missing spots. My only small gripe is it wouldn’t cover all of his “add ons” the way it does. By now, dear reader, you should know that I buy figures based on cool accessories. Even as wee little nerd I was the same way. I remember almost passing on Firefly because he didn’t have a helmet. He does have a lot of other cool stuff, though. Highlighted on the card art, Firefly’s backpack is his key accessory. It is sculpted with a number of little details. Everything a saboteur would need is there; explosives, wire cutters, and other tools. One of the few packs to have two pieces, the cover has a socket set sculpted on the inside. One small nit is the cover is only loosely attached. I rarely display him with it, because I’m afraid of it falling off and becoming vacuum fodder. Second cool accessory? Firefly has a small radio thingee. I know it’s not a cell phone because it’s too small for 1984. Molded in green with an antenna, it’s a tiny accessory that we never really saw enough of in the vintage Joe line. Finishing out his accessories is, of course, a gun. Molded in green instead of the typical grey for GI Joe weapons, this sub machine gun was unique for Firefly. It has a light weight stock and looks like something a saboteur would carry. 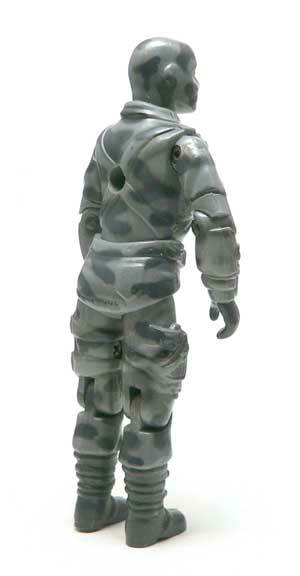 Something I didn’t expect when I was kid was the fact that Firefly’s head could wear a generic GI Joe helmet. It is something that didn’t need to work, but did. Again, this is more like what I always imagined Cobra Troopers to be like. I understand they would guard there base with the blue suits. But, part of me always thought Cobra would do most of their fighting in a sneaky way. Just like a saboteur like Firefly would do. One of mine too. It’s easy to see why he has a bit of a cult following. A classic. I never noticed the details you noted as a kid. What drew me to the figure was his awesome camo, unique accessories, and file card bio. The comics and cartoon somehow never built upon this info enough for me. Firefly was such a popular figure back in’84 that he was one of the last ones I found that year along with Mutt and Storm Shadow.